The Housing Office has introduced an online “Housing Smoking Agreement Form” for use by residents of six undergraduate dormitories who wish to request permission to be allowed to smoke in their rooms. The form was created in compliance with a Cambridge ordinance that includes a line which states that students have to agree in writing to smoke in their rooms, according to an e-mail sent by the Housing Office to the residents of the six dormitories. 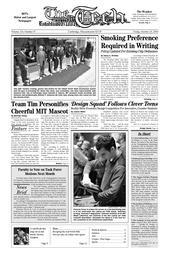 Although the ordinance was put into place in October 2003, MIT did not previously require students to submit requests in writing. A completed Web form is considered to be a written request. According to Robin Smedick, the assistant director of Housing, one of the student concerns is what the information will be used for. “The forms and information gathered will be housed in the Undergraduate Housing’s Central Office’s secure database to protect the privacy of our students,” the e-mail said. City of Cambridge Ordinance No. 1265 bans smoking in workplaces and in buildings to which the public is permitted access, including student residence halls. One exception to this rule is “university Dormitory rooms occupied by one or more students, all of whom are smokers, who have requested in writing to be placed in rooms where smoking is permitted by the University.” If all residents of the room do not fill out the form, or cannot come to an agreement, smoking is not permitted. The city ordinance also requires all roommates to be “smokers,” as opposed to permitting smoking in their room, a concern for many students. “We’re not trying to identify smokers,” Smedick said. “If that was the case we’d ask all students to fill out the form.” Smedick said that this is just a matter of self disclosure on the part of the students. Students are responsible for following the policy, she said. “This is not an MIT policy per se, but MIT is going to abide by it,” said Daniel Trujillo, associate dean for alcohol education and community development. City inspections are a way to enforce the policy, but it is up to each living community and house team to abide by the policy. The appropriate judicial body, such as the Dormitory Council Judicial Committee, will be consulted in the case of disagreements, Trujillo said. The undergraduate dormitories that permit students to smoke in their rooms upon request are Bexley Hall, Burton Conner, East Campus, MacGregor House, Random Hall, and Senior House. Housing “worked with the MIT legal office to look at the policy,” Smedick said. Ordinance No. 1265 was approved in Cambridge in June 2003 after similar smoking bans were passed in Boston and Somerville. The Housing Smoking Agreement Form can be found at http://web.mit.edu/housing/undergrad/smoking_agmt.html.